Clay Freeman was not the suspicious sort, until multiple customers started snapping pictures inside his St. Augustine, Fla., spice and tea shop. A man for all seasonings: Clay Freeman. That was back in 2008, and though The Spice & Tea Exchange is now a 43-unit franchise, it’s not the Starbucks of spices—yet. Freeman never expected to launch a spice and tea empire. But that first location became so popular that opening more stores—and franchising—seemed a natural progression. 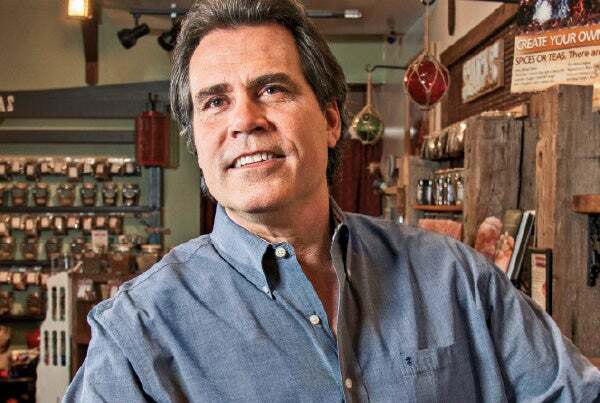 Now he is prepping for a 15-unit expansion of his concept, which sells more than 125 varieties of whole fresh spices (plus more than 80 blends ground and combined in-store), 36 loose-leaf teas, 30 salts and 16 naturally infused sugars in a rustic, antiques-laden space reminiscent of an 18th-century trading post. We got Freeman to set down his mortar and pestle so we could chat about his well-seasoned success. I did a lot of international travel working for an airline and travel agency, and I saw these wonderful spice markets around the world. I once stumbled into a chain store that sold only spices, but it was basic and simple—like ACME spices. I thought if I could dress this up and add some historical relevance, it could be cool. At the grocery store and ethnic stores, the freshness and flavor simply isn’t the same, since our domestic grocery stores have an inherent and lengthy “time on the shelf” life because of distribution and warehousing necessities. Also, grocery store seasonings and spice blends usually have preservatives and other additives in them or are heavily salt-based. It just seemed natural to me that there was a niche demand for exceptionally fresh and well-made seasonings. Why did you decide to franchise? I wanted to expand my stores, but I knew I couldn’t manage them remotely. The only way to get the attention they needed was through mom-and-pop ownership, and the only way to do that is through franchising. So I had to figure out what this franchising thing was. It was quite a journey. We grew by pure word-of-mouth the first couple of years. I bought a van and a trailer and went out and built those first stores myself. I lived in the trailer and trained the franchisees and staff on-site. Talk about doing it yourself! I then added some partners and back-end and support structures. We were patient and made sure we did things right, adding a marketing department, field consultants and getting the whole thing set up. Now we’re really poised to break out. What type of franchisees are you looking for? I want owner-operators—that’s the key to this whole thing. I feel that the stores need to be locally run by people who have a sincere passion about the products and the concept, and are there to talk in person to the visitors of the shop. The fact is, we offer something everyone loves. We’re not trying to sell mobile phone plans. Everyone eats, and with such high-quality ingredients, shopping here is a no-brainer. It’s a soft sell. What’s your most popular spice? It varies. If there’s a big discussion on the Food Network about cinnamon, then we’ll see a rush on cinnamon that week, or when Oprah mentions a flavor, there will be a run on that. Overall, our blends are popular. I think everyone is looking for more convenient but flavorful options. We have chefs who come in looking for unique and exotic spices, and we’ve got that covered. But we also get the mom with three kids thinking about what she’s going to do with the chicken tonight who picks up some Tuscany or Jamaican Jerk seasoning. It’s amazing how much a seasoning can change a meal.